At UC Guru we hope to explain and demystify unified communications, especially when it comes to Cisco Unified Communications Manager (AKA Callmanager) in all it’s flavors and accessories. If you’re looking for an understanding of Unified Comunications, or tips on how to install, configure, and get the most out of Call Manager, then you’re in the right place. Free CDR Tool / Call Accounting – Grab a free copy of VoIP Detective and easily track calls into and out of your organization. See how may calls your sales team made, how many calls went to voicemail in customer support and more. You can learn more here. This is a virtual machine that is easily deployed in a matter of minutes. 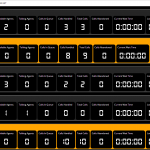 Free UCCX Wallboard – I’ve recently finished updating and refreshing a free wallboard script, built off of Leo Mourits’ fantastic Free of Charge wallboard 2.4. You can get the full details and download the script here. This script runs on a windows server, and pulls CSQ data from your UCCX server. Quickly deploy phones using Auto-Regisration and TAPS. Build hundreds of phones in excel quickly, then by pressing a phone buttons on each handset you’ll be able to merge the excel phone with a new handset.